ESL lesson plan that will help your students learn and revise past simple tense, especially asking Wh questions. During the lesson students will improve their listening and speaking skills. 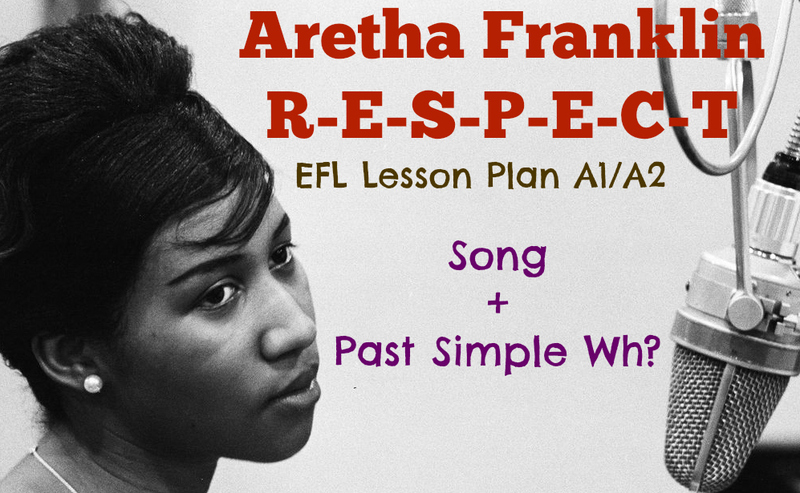 At the beginning your learners will listen to the song ‘RESPECT’ and later find out more about the souls diva- Aretha Franklin. By the end of the lesson your learners will be able to ask and answer complex questions in Past Simple. Topic: Music, Past Simple Wh? Play ‘Hangman’, use the word – r-e-s-p-e-c-t as the clue. Once Sts guessed the word explain the meaning. Later distribute the words that are within the lyric. The words are prepared and ready to cut – check worksheet 1. Distribute the words, make sure each student has one or two words. Check if your students know the meaning of these words. Sts task is to lift the word up once they hear it. You could ‘test’ it by saying some of the words and as practice- student should put the words up. Play the song, Sts listen and lift the word. Once the lyric’s ended, ask students to exchange the words and play the song again. 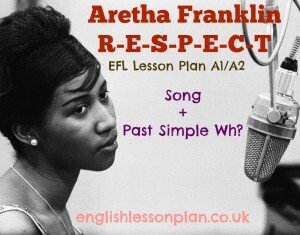 Ask students if they know anything about Aretha Franklin e.g. where is she from? Is she still alive? Do they know any other songs? Tell students they’re going to read a text about Aretha. Divide sts in pairs A-A, B-B, explain that the text is not complete and the other student has the answer. But to find out the missing info, they have to create questions relating to the details that are missing. Monitor sts closely and make the structure of the questions is correct. Once all the pairs have 8 questions, mix pairs A-B, A-B and allow students to ask and answer the questions. As a folow-up you could ask your students to hide the text and later rewrite it (while writing they should include as many details about Aretha as possible). During this task students work in pairs A-B, A-B.